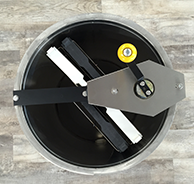 Maxant 4 frame hand extractor, our newest addition to our extractor line, is great for the backyard beekeeper who wants to be able to extract frames at home. The basket holds 4 medium or shallow frames, or 2 medium and 2 deep frames radially. 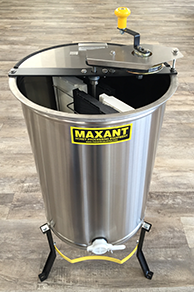 Made in Devons, MA at Maxant's facility, this extractor comes complete with lids and Maxant's signature nylon honey gate. Add a leg kit and you have a great way to extract your honey!